The 10 Tierra outdoor furniture offering by Caluco is expansive, and includes deep seating, dining and counter height options. The patio furniture featured on this page is all bar height, which is extra tall seating that stands above both dining height and counter height options. 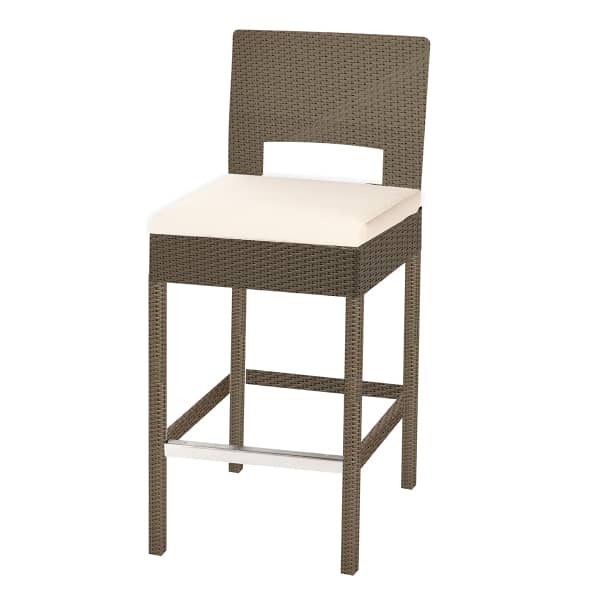 The bar height stool and table combination is ideal for outdoor placement, perhaps poolside, and is commonly used for sunset drinks, intimate brunches and other quiet moments for wining and dining at home. The Tierra set of outdoor furniture is built with an extruded frame that is not visible, but is integrally supportive. The frame is totally wrapped in a woven wicker material. Instead of traditional weather, which cracks and corrodes with exposure to the elements, Caluco uses synthetic, highly flexible, tensile-strength polyethylene fiber that looks and feels like traditional wicker but doesn’t require all of the fuss. The seats are topped with a comfortable cushion, which is wrapped in Sunbrella fabric. The offering of Sunbrella fabric is expansive and available for your choosing. Browse to select the Sunbrella design that will accent your stools perfectly!